Getting a DigitalOcean VPS … Why! SSD Hard Drives is faster 20x times than normal HHD Hard Drives. yes, it’s less than One Penny per hour. DigitalOcean offers simple panel wich can control VPS, view Graphs, backup and take snapshot from one place. creation VPS with only 55 Seconds. DigitalOcean VPS is cloud hosting! So, you need to visit DigitalOcean and follow this steps to get your account. DigitalOcean offers a wide range of server locations, choose the nearest one to your targeted audience so this will make your server latency faster as possible. DigitalOcean offers a wide range of Linux Distros to choose from, so feel free to choose a suitable Os for your needs. you can also choosing from pre-installed distros with popular scripts and install it with one click without any need to do Linux Commands to install web server or MySQL ,like: WordPress on Ubuntu 14,4 or Joomla on Ubuntu 14,4 …etc. Backups are costing 20% of your invoice monthly .. so if you choose a $5 VPS .. then the total cost will be $6. this option is Recommended so this is like an undo button .. you can make changes to your DigitalOcean VPS and if you got something wrong then you can restore a backup. 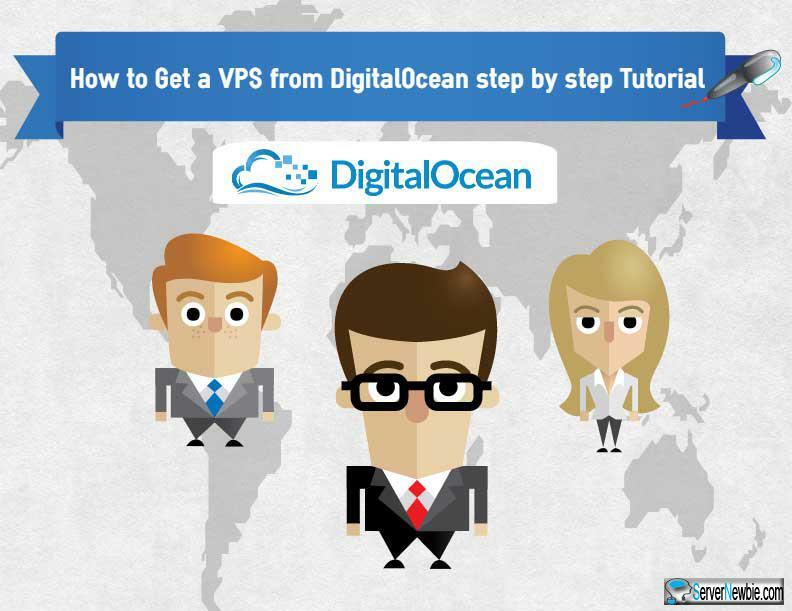 in less than 55 seconds your DigitalOcean VPS will be created and ready to use. check your mail and you will find an e-mail from DigitalOcean contains your VPS login details. like droplet name, IP address, username, and password. Now, you get a DigitalOcean VPS and ready to use, the next step is how to deal with DigitalOcean Control Panel. on every web page in your DigitalOcean Control Panel, you will find your VPS Specs, server location, OS and your VPS status, a green button as online and a gray button offline. From Access pane, you can login to server console without the need to use putty app directly from your web browser. and changing VPS Root Password. from your panel, you can resize your droplet to bigger or smaller one. you see two options for resizing Permanent and Flexible. what is the difference between Permanent and Flexible resize? but with Flexible resize you can undo upgrade and make downgrade cause your Hard Drive size will Not be expanded. From Snapshots pane, you can take Snapshots for your VPS. snapshot mean a Manual Backup for your entire VPS. note: just remember to Turn Off your VPS to be able to take a snapshot. from Kernel tab, you can change your OS kernel to any kernel in the list. for example: downgrade your CentOS from 6.5 x64 to 5.2 x32. from recovery tab, you can attempt to restore a corrupted file system. Note: you should Turn Off your VPS to be able to mount recovery kernel. for example: I gonna change my test VPS name from “servernewbie.com” to “osamaalgendy.com”. note: it doesn’t change your system hostname. from Graphs pane, you can check statistics in real time your VPS Bandwidth, Disk “Read-Write” and CPU load. from History pane, you can view your droplet history like power on off – rename … etc. from Destroy pane, you can destroy your VPS . note: it’s Highly recommended to check “scrub data” option cause it’s the safest way to destroy you VPS space. – when you turn off your VPS , you still paying for it cause there are space,Ram, CPU reserved for it. But by Destroying it, you will Not paying for it anymore. it means destroy droplet and build a New one from the list. for example: destroy my current Centos 6.5 and build a New one with Ubuntu 14.4. DigitalOcean VPS offers a cutting edge cloud hosting, from less than 1 cent per hour with a very simple panel and tons of options which enable you to perform common tasks with few clicks, so many websites including ServerNewbie got DigitalOcean VPS.